Stay in Menorca's best hotels! Offering a year-round outdoor pool and views of the city, Sindic Hotel is set in Mahón. The hotel has a seasonal outdoor pool and sun terrace, and guests can enjoy a drink at the bar. Super large bed and huge room with great double shower. Very tasteful conversion of an historic building..Manager and staff incredibly helpful. Featuring a terrace and free WiFi, Hotel Nou Sant Antoni is located in Ciutadella, a 6-minute walk from Cathedral of Minorca and 2 miles from Ciutadella Lighthouse. The hotel was only opened in June and is absolutely beautiful. The decor is stunning yet makes you feel like home. It's located in the heart of Ciutadella and is a quiet oasis in the middle of the busy streets of old town. The owners are there ready to help out every step of the way. Sodium Boutique Hotel offers rooms with a balcony or terrace in Ciutadella's Old Town, in the Menorca island. Sa Caleta Cove is 1.9 mi away. Marcello was a great host and provided great advice on the beaches. Nice location and everywhere of interest is a short walk away. The Francio room was clean, bright, airy, with a lot of space. The bed was super comfortable, medium firmness . The artwork was also really nice, which I don't think I've ever noticed about a hotel room. Beach towels and beach umbrellas were provided. The breakfast spread in the mornings was great and will get you off to a good start! Located in Es Migjorn Gran, 2.9 miles from Santo Tomas Beach, S'Estil·let has air-conditioned rooms with free WiFi. Among the various facilities are a terrace and a bar. Lovely little boutique hotel in a sleepy village and only 5 minutes drive to the best beach in the Island, Binigaus! Located in Ciutadella, 656 feet from Cathedral of Minorca, Petit Hotel 5 Fars features air-conditioned rooms and a shared lounge. Every room comes with a flat-screen TV. Super friendly staff and great location. Featuring free WiFi and an indoor pool, S'Hotelet d'es Born - Suites & SPA offers accommodations in the center of Ciutadella. The property is set in a historic 16th century building. Location, details, local vibes, charming. 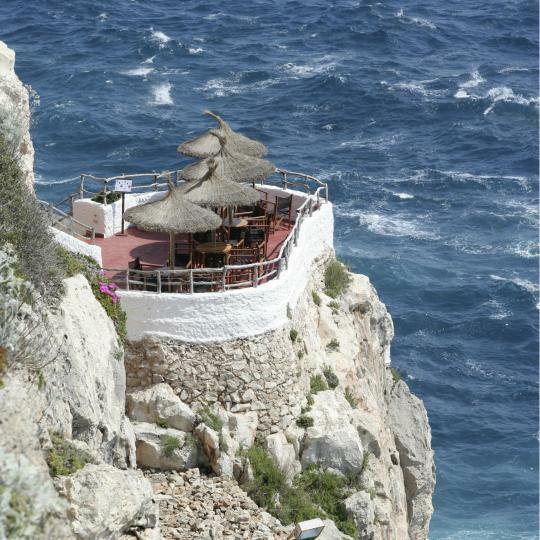 Featuring a terrace and bar, as well as a restaurant, Mon restaurant & fonda is located in Ciutadella. Staff is really nice and helpful, they made us feel at home. Amazing breakfast. We also tried their restaurant for dinner and WOW...food quality and service were just fantastic, I'd strongly reccomend to try it! Rooms and furniture are brand new, you'll find natural materials and relaxing colours, the design matches so well with the magic atmosphere Menorca's uncontaminated nature. Super recommended!! Ca S'arader has rooms with free WiFi in Ciutadella, conveniently set a 7-minute walk from Cathedral of Minorca and 0.7 miles from Wind Fornells Windsurfing and Sailing School. Best hotel and best host ever! Not a single little bit imperfection. Everything wonderful! Will come back! Located in Mahón, within an 11-minute walk of Mahon Port and 6 miles of Es Grau, Hotel Hevresac has accommodations with a terrace and free WiFi. The property has a shared lounge, as well as a bar. Located in the heart of Mahón, Boutique Hotel Sant Roc & Spa offers a free spa & wellness center, a 7-minute walk from Mahon Port. Rooms feature air conditioning and flat-screen TV. The pillows were fabulous! Nice hard & firm. The staff were wonderful and friendly. Set in Ciutadella’s Old Town, just 5 minutes’ walk from Ciutadella Port, My Rooms Ciutadella offers rooms set in a renovated house dating from 1900. So nice to have a lovely bedroom and bathroom but the real jewel in the crown was the shared areas. Located in the center of the island of Menorca, the Hotel Loar Ferreries features a lovely rural setting, located in the small town of Ferreries, between Es Mercadal and Ciutadella. Excellent hotel in the center of Ferreries with very friendly and helpful staff. Hotel Balear is located in the Menorcan coastal town of Ciutadella, just 10 minutes’ walk from the historic center. Offering superb views over Mahon Bay, Catalonia Mirador des Port is an elegant white building set in gardens. It features a seasonal outdoor pool and free Wi-Fi. Great breakfast. Beautiful view. Located in Ciutadella, 1476 feet from Cathedral of Minorca, Smoix hotel features accommodations with a terrace. It has a boutique hotel style with industrial design, all details are very fine. Offering free WiFi, Divina Suites Hotel Boutique Adults Only is located in Ciutadella, within a few steps of Cathedral of Minorca. All rooms have a kitchen and a private bathroom. Ca S'arader has rooms with free WiFi in Ciutadella, conveniently set a 7-minute walk from Cathedral of Minorca and 0.7 miles from Wind Fornells Windsurfing and Sailing School. Best hotel and best host ever! Not a single little bit imperfection. Everything wonderful! Hotel Can Roca Nou provides rooms with free WiFi in Mahón, located conveniently 1.2 miles from Mahon Port. All rooms feature a TV with satellite channels and a private bathroom. Very clean. GREAT location. Very comfortable bed and great bathroom. Binibeca is a maze of narrow, winding streets and whitewashed houses, with architecture reminiscent of both Arab and Mediterranean styles. 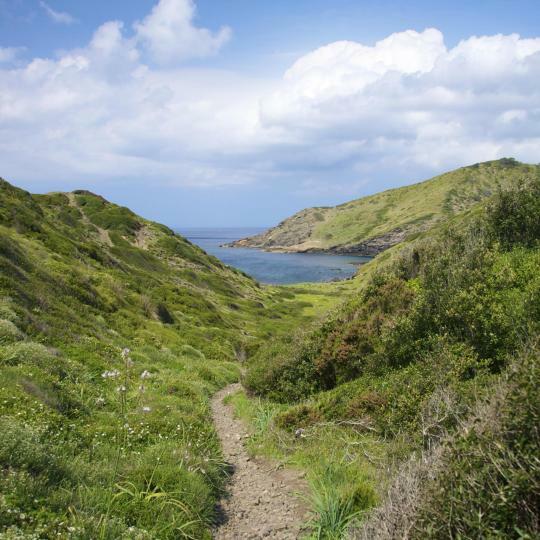 The Camí de Cavalls Trail traces the entire 185 km of breathtaking Minorcan coastline, linking ancient watchtowers, lighthouses and coves. 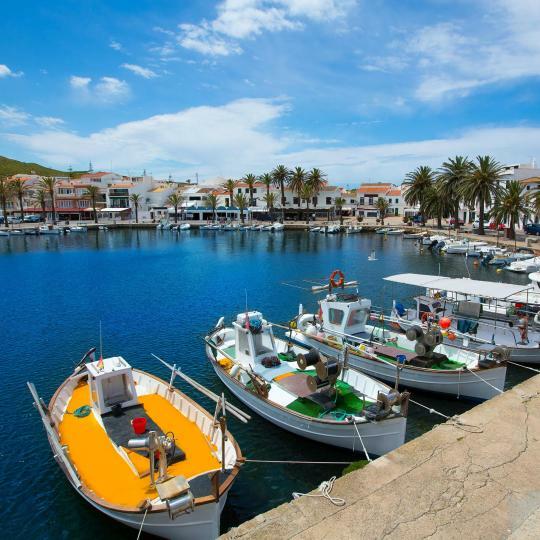 Crystal clear waters at this natural port lead to unspoiled beaches and small islands only reachable by kayak or boat. These caves and terraces are a chill-out spot by day and a thriving club with international DJs by night. Walking routes around the wild landscape of S'Albufera des Grau Nature Reserve are dotted with viewpoints and bird watching cabins. 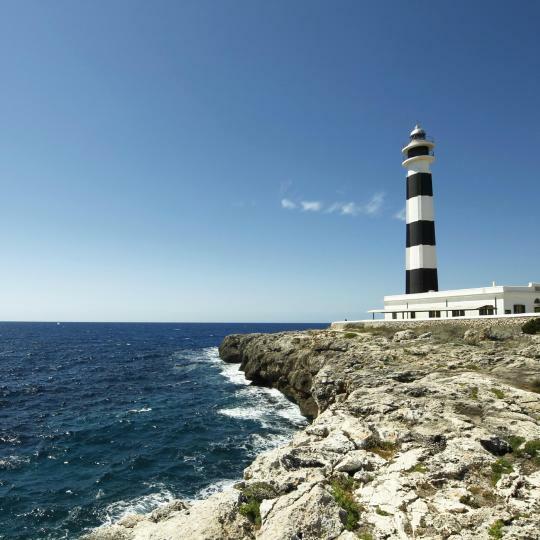 Minorca’s characteristic lighthouses are dotted around the island’s coast, at some of its most unique and beautiful viewpoints. The red sands, clay and mud of this unspoilt beach provide the perfect natural resource for an improvised mud bath. 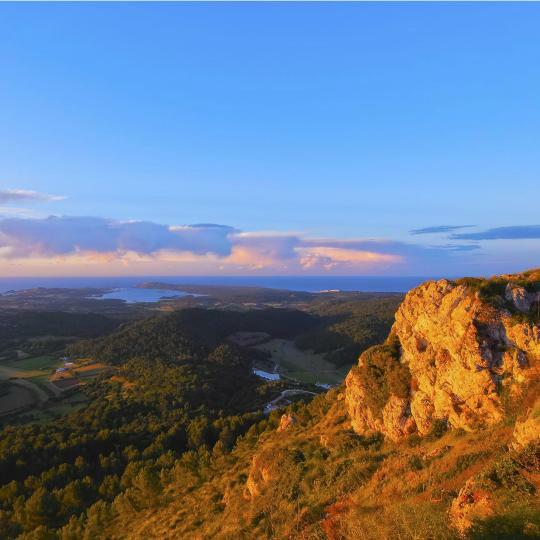 Mount Toro is Minorca’s highest point and offers unequalled views of the whole island and, on clear days, Majorca. 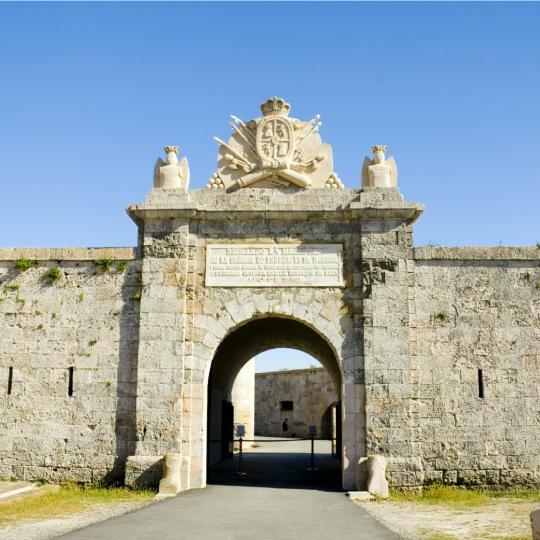 Presiding over Mahon Harbour, explore the inner chambers of La Mola Fortress or enjoy the fantastic views of the coastline. Spain’s most easterly town, Es Castell is a charming spot to take in the country’s first sunrise of the morning. A beautiful Balearic Island, Minorca (or Menorca) has wonderful beaches, sandy coves and a more laid-back atmosphere than its neighbors, Ibiza and Majorca. Featuring the world’s 2nd largest natural harbor, its capital, Mahon, is the center of the nightlife, with several clubs and bars. However, as soon as you head to one of the Menorca resorts, things start to slow down. Punta Prima along the coast has a lovely Blue Flag beach, while the longest beach at Son Bou on the south coast is lined by protected sand dunes. 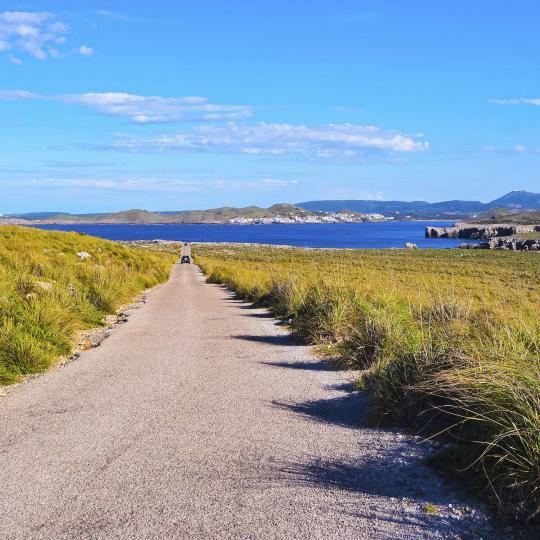 Much of Menorca’s unspoiled beauty is ecologically important, so it’s worth heading inland from the beaches to explore the mountains. The views from the highest peak, Monte Toro, are amazing. Also worth checking out are the "taula," prehistoric megaliths of mysterious origin. Another prehistoric monument is the Naveta tomb near Ciutadella, a city centered around its port, partly lined with walls. Fantastic Cala Blanca and Cala’n Bosch to the south have a nice range of luxury Minorca hotels available on Booking.com, as does curving Cala Galdana where the sea appears almost green. On the more rocky north side of the island, the main resorts are Fornells, a pretty fishing village, and Arenal d’en Castell, home to yet another wonderful horseshoe bay. The Hostal is really clean and the staff, especially the owner is polite, funny and always available which made me feel home. The room has a good space, with air condition, extra blanket, guard robe with hangers. Parking space and a small swimming pool just outside the Hostal which we had no chance to try as the weather wasn’t that good in April. Can be the perfect match if you plan to spend your days out, driving and visiting Menorca as there is not much to do in the Hostal itself. Overall experience was very good though. The hostel was available for an extremely competitive price compared to the rest of Menorca, which could be due to its location. 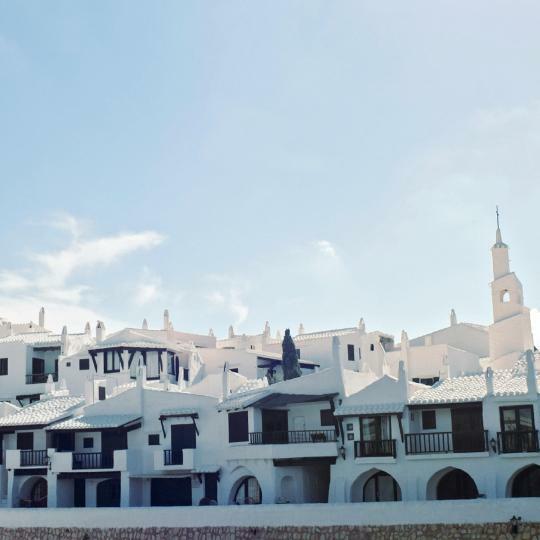 It is in one of the island's smaller towns, which many may view as a negative, but Sant Luis really was very charming, and not far at all from Mahon amongst other sights/places. The rooftop was extremely comfortable to relax on as well. The staff was perfectly friendly, and despite the lack of amenities or a better sleeping arrangement, everything was very clean. Great location, beautiful view from the balcony, 30-minute hikes to some of the best calas in Menorca, plenty of restaurants and supermarkets nearby, great for families. The apartment had all amenities you need for a vacation, nice kitchen space and plenty of cooking equipment. Spacious and comfortable. Pool on property is great and there are chairs and sun beds on personal balcony. Very nice host. Would stay here again! Spacious room with a lovely view from the balcony on the 5th story. The staff were friendly and professional, check in and out was a breeze. The pool was really nice, with just enough loungers for the number of guests who were there at the time. Breakfast had a good selection of foods and drinks. 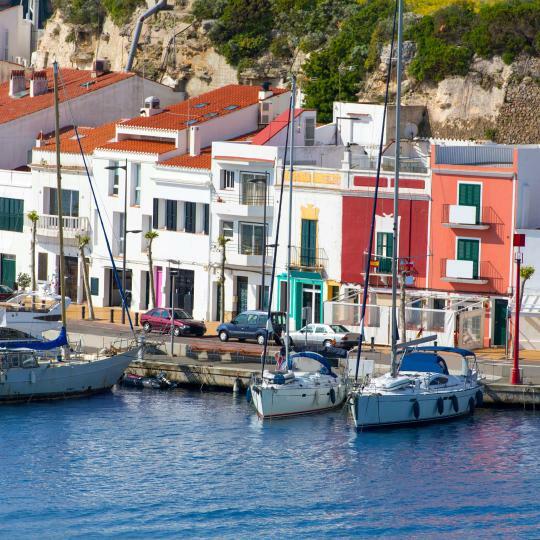 Es Castell itself is a lovely little village in Menorca with a pretty harbour. Free off-street parking. Excellent location by the water in Ciutadella, plenty of street parking around the hotel. Staff as very friendly and accommodating. The apartment itself (3 bedroom, 2 bath) was extremely spacious and clean; for only two people it felt like a mansion. For the price, location, and service, this hotel is nearly unbeatable. Will try to stay here again on our next trip to Menorca. Finca Atalis is an amazing resort meets bed and breakfast. The property itself is a working farm fronting the Mediterranean Sea. 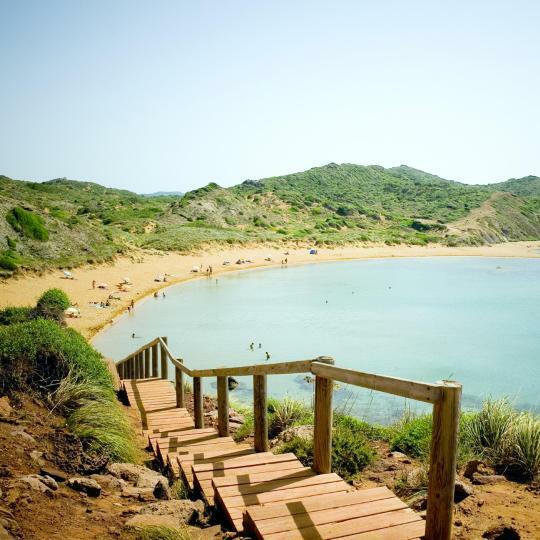 From the infinity pool you can look (unobstructed) upon one of Menorca's many beautiful beaches. The staff was equally as incredible, helpful and courteous. We never wanted to leave but we are so thankful we found this amazing place. The staff at the resort were absolutely great! We had an amazing 2 BRM suite overlooking the pool & ocean. The food at the restaurant had something for everyone in the family. Fine dining was a short drive from the hotel. This is a great resort on an amazing island. I would highly recommend this resort to anyone visiting Menorca. The property is clean, great location. Close to a beautiful little bay with some restaurants. We walked from the hotel to Mahon and it was a great walk. The views from the hotel are great, perfect for people who want to enjoy menorca in peace. Comfortable beds. Clean bedroom and bathroom. Good breakfast. Very good location (15 min walking to Ciudatella city center) and perfect for visiting (by car) the most beautiful beaches in Menorca. Helpful staff. Will definitely come again! The manager was not helpful; practically had to beg for more blankets. Still cold in April in Menorca. Other staff tried hard. Manager needs improvement. Property comfortable pleasant, good breakfast. The house is in traditional Menorcan style, and the neighborhood is tranquil and beautiful. Would be a nice place to enjoy a vocation here. The staff are nice and helpful. The food was excellent. Parking was on the streets front/near the hotel, but it was enough (consider we stayed in October) and safe. Staff was helpful, hotel provided a room after check-out so that we would take a bath before leaving. The pool was great and the food even better. No delays getting drinks from the bar under all inclusive. Great location near the beach but everything you need at the hotel. The facilities were nice, simple and clean. There was a microwave, dishes and cutlery and tools to boil water and make orange juice and coffee. Located right on a very nice beach. Staff generally friendly.